The ability to address questions of genetic identity in exotic animals is now dramatically enhanced. The DNA profile and DNA amplification testing services offered by Therion International are more powerful than conventional blood protein analysis because they detect DNA-sequence information which is highly variable. These technologies provide a more sensitive method of parentage verification and can be used to enhance captive breeding programs through the estimation and maintenance of genetic variability. Our laboratory also provides the services of bird sexing and contract research to identify genetic markers linked to preferred traits and/or genetic disorders. To date, our staff has successfully processed samples from well over 350 species/breeds of animals including: mammals, birds, reptiles, amphibians, fish, and invertebrates. Following are descriptions of three of the many DNA-based projects that have been completed by Therion. A study was conducted to verify parentage in captive nesting pairs of scarlet and Waldrapp ibises. The autoradiograph at right depicts the DNA profiles of a nesting pair of scarlet ibises and their chick. Note that each genetic marker observed in the DNA profile of the chick can also be observed in the DNA profile of one or both adults thus verifying parentage. No scarlet ibis chicks were found to be the product of an extra pair copulation. However, some Waldrapp chicks were excluded from being the offspring of the mated pair in whose nest they were found. To ensure the long-term reproductive success and survival of captive-bred populations of animals, it is essential to routinely monitor levels of genetic variation. Pictured below are two sets of DNA profiles (probe OPT-05) generated from individuals belonging to two separate colonies of New World primates. Population A exhibits high levels of genetic variation (as indicated by a low level of band sharing among individuals). In contrast, population B exhibits a low level of genetic variation (as indicated by high levels of band sharing among individuals). Note the nearly identical DNA profile banding patterns among individuals of population B. DNA profile results such as these can be used to generate estimates of heterozygosity, genetic distance and relatedness. A private breeder of reptiles needed to determine the paternities of a clutch of python snakes. The mother of this clutch had been bred to two males and because multiple paternities are common in reptiles, it was necessary to identify and partition the offspring into full sibling groups. 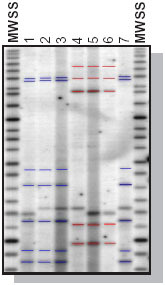 The results were generated using probes OPT-03 and OPT-05 and enzyme HinF I. Visual inspection of the DNA profiles showed two subsets of similar banding patterns among the young snakes (figure at left). Computation of band-sharing coefficients corroborated that the clutch of offspring could be separated into these two distinct subsets. The average percentage of shared bands within both the first subset of offspring (blue bands) and the second subset of offspring (red bands) was 63%. Between the two groups the average band sharing was 26%. It was therefore concluded that each subset consisted of a group of full siblings, each with a different sire. Download the Adobe Acrobat version of this page (exotican.pdf).